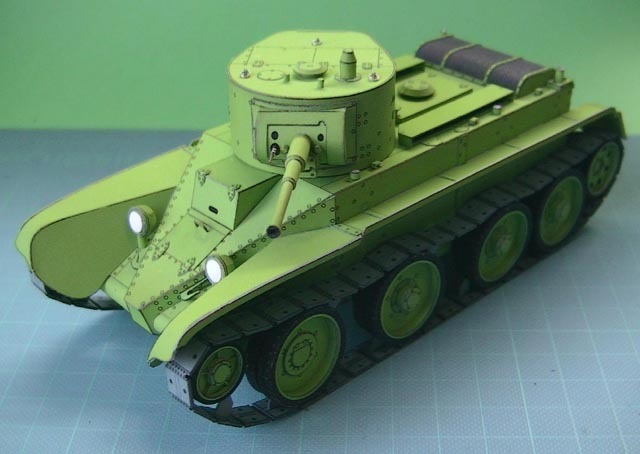 This paper tank is a BT-5 fast tank, designed by Cho. The BT tanks (“fast tank” or “high-speed tank”) were a series of Soviet cavalry tanks produced in large numbers between 1932 and 1941. They were lightly armoured, but reasonably well-armed for their time, and had the best mobility of all contemporary tanks of the world. The BT tanks were known by the nickname Betka from the acronym, or its diminutive Betushka.